What is Google for Jobs and How Will It Impact Recruiters? What is ‘Google For Jobs’? 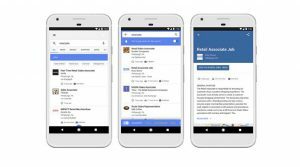 ‘Google For Jobs’ was already in place in the United States but the search engine’s newest feature is now up and running in the UK as well. This new aggregation tool allows you to enter a job search just like any other search query. Within the subsequent search results, Google will now draw out those it believes to be most relevant to your query and present them in a clearly defined box at the top of the page. Their goal is to connect a jobseeker with their perfect job as quickly and easily as possible. A large number of people searching for a job online already turn to Google as their first point of call, even if it’s just to locate other aggregation sites. 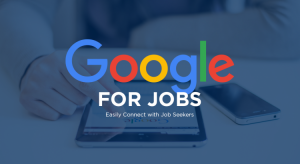 With ‘Google For Jobs’, Google want to capitalise on that traffic and provide a more efficient and convenient experience for the job seeker. If they can’t find the job they’re looking for straight away, a jobseeker can save that particular search query or request Gmail alerts for any new listings. They won’t see any additional adverts and Google aims to remove any duplicates. Google’s artificial intelligence now has a more advanced understanding of language and so can realise that two job postings with slightly different titles are fundamentally the same. This means that job seekers are less likely to miss out on jobs because they haven’t used the exact same terminology as the advertising company. Jobseekers can also make use of Google’s geolocation capabilities and by simply searching ‘jobs near me’. The search can be further narrowed down by specifying full time or part time work, a specific company or a salary range. To help them locate as many jobs as possible, Google have teamed up with some of the major job aggregation sites including The Guardian Jobs, The Telegraph, Reed.co.uk, LinkedIn, Haymarket and more. The noticeable absence is Indeed. How can in-house recruiters use ‘Google For Jobs’? The major benefit for in-house recruiters is that unlike other aggregation sites, you don’t need to pay for your listings. Instead of sending them out to third party sites, you can now simply list them on your own website (with the correct indexing). More interested traffic will be driven directly to your own site, with people then able to apply there and then. From a technical perspective, there are two tasks that must be complete in order for your job listings to appear in ‘Google For Jobs’. When posting a new job, you need to ensure that is done with Job Posting structured data. You also need to submit a sitemap (or RSS or Atom feed) with the tag <lastmod> on each listing. There are FAQs available to help with this coding. It will also help if your website is mobile-friendly and features regularly refreshed with keyword optimised content. Google will always reward those sites with updated content so there is the potential for smaller companies with less structured marketing strategies to miss out on ranking. Furthermore, double check that your own job listings are being posted on the same domain as your website.